Elizabeth Hitchings (baptised on 12 May 1751 at St Aldate’s Church). Edward’s mother Mary died at the beginning of 1757 when he was only seven years old. At the age of thirteen he was apprenticed to the tailor Richard Horn for seven years from 10 December 1762. Twelve years later, on 26 December 1774, Edward Hitchings was established as a tailor and took on his own first apprentice, William Shepherd, followed by three more in quick succession: Edward Aris in 1776, Richard Taylor in 1779, and Richard Kendall in 1781. Elizabeth Hitchings (baptised on 9 July 1797 at St Aldate's Church). 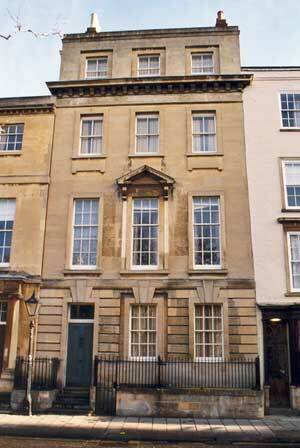 Hitchings was first elected on to the Common Council on 30 September 1780, and in 1786 was elected Senior Bailiff. Hitchings’s father John died at the age of 90 on 18 September 1789, and Jackson’s Oxford Journal described him as the father of the “eminent Oxford tailor” Edward Hitchings. On 25 March 1790 Hitchings took on William Willmot as his apprentice, and on 12 April 1798 Joseph Taman. Hitchings is listed as one of the Ensigns of the Committee & Officers of the Corps of Oxford Loyal Volunteers in Jackson’s Oxford Journal of 4 January 1800. On 20 March 1800 Hitchings was chosen to be one of the Assistants, and on 30 September that year was elected Mayor of Oxford (for 1800/1), naming John Hickman as his Chamberlain. Eight months later, on 22 January 1803, the newspaper reported on the marriage of Hitchings’ eldest surviving son, Henry Edward (who would have been barely 21) to Miss Joanna Slatter, the youngest daughter of an Oxford plumber & glazier. On 24 October 1806 Hitchings’ second son James, destined to enter the Church, was matriculated at the University of Oxford by Christ Church at the age of 16. Hitchings continued to run his tailor’s shop, and Jackson’s Oxford Journal of 22 January 1803 reported that a thief who had stolen a piece of Irish linen cloth, “the property of Mr Edward Hitchings, Tailor, of this city”, had been apprehended. Hitchings was appointed Lieutenant of the Oxfordshire Local Militia in August 1810. Edward Hitchings was made an Alderman in 1811 and was elected Mayor a second time (for 1811/12). As there was a Royal Visit to Oxford during his mayoral year, he was knighted. On 27 January 1820 Balliol College granted to Sir Edward Hitchings a lease of 14 St Giles’ Street and 15 St Giles’ Street for 40 years for a payment of £145 2s 6d. and a rent of 5s. for the former and 20s. for the latter. He moved into No. 14, which adjoins the north side of the Lamb & Flag Inn, and let out the house next door. Also in 1820 Hitchings gave stock yielding £6 a year to provide payments for six poor families (three from St Giles’s parish and three from St Aldate’s), and also 16s. each for four poor aged tailors (two from each of those parishes). His book Joseph: A Poem was published in 1820. Sir Edward Hitchings was elected for his third and last term as Mayor of Oxford for 1821/2. Nov. 21. In St. Giles's, Oxford, Sir Edward Hitchings, Knight, one of the four Aldermen of the City of Oxford, and for many years a highly respected inhabitant of that place. He was buried at St Giles' Church on 26 November 1825. On Monday last died, aged 76, Sir Edward Hitchings, Alderman, and three times Mayor of this City. He was, throughout life, universally respected, and few in their native place have ever been more universally beloved. He secured the respect of all by the uniformly upright and useful tenor of his life; and he was regarded with no common love in this place, because all knew and many experienced the genuine goodness of his heart. He was ever the prompt and liberal partaker in every plan of public benefit or private charity; the promoter of all that he deemed meritorious; the frequent assistant of those entering on the trials or struggling with the difficulties of life: he was a friend of the poor. He sustained a long and painful illness with christian patience, and died in christian faith, and peace, and hope. In his will he left money to help the poor people of Oxford, but the Sir Edward Hitchings Charity was amalgamated into the City of Oxford Charity in May 2004. At her late Residence, near Magdalen Bridge, Oxford. On Tuesday and Wednesday next the 13th and 14th days of September, 1831.—The genuine HOUSEHOLD FURNITURE, CHINA, a fine-toned PIANO FORTE, VALUABLE PRINTS, PAINTINGS, and BOOKS, of of [sic] Lady Hitchings, deceased, at her late residence, near Magdalen Bridge, Oxford.—The Furniture consists of Brussels and other carpets, moreen and chintz window curtains, four-post and other bedsteads, fine bordered feather beds, flock mattresses, blankets, quilts, and counterpanes; mahogany dining, sofa, card, and other tables; mahogany and painted chairs, several services of elegant china, and an excellent assortment of culinary articles. His second surviving son, James Hitchings, who had gained his BA at Christ Church in 1810 and had served as an Ensign with the Oxfordshire Local Militia in 1812, was Curate of Stratton Audley in 1813 and Vicar of Wargrave, Berkshire, from 1826 until his death on 7 May 1850. His third surviving son George Hitchings became surgeon at the Radcliffe Infirmary and the first of three generations of Oxford doctors; and George’s son Dr Robert Hitchings was the co-founder of Headington (later Oxford) United. His daughter Elizabeth Hitchings married James Prickett on 25 September 1826 at St Mary Magdalen Church. Their daughter Mary Prickett became the governess of the Liddell children of Alice in Wonderland fame.